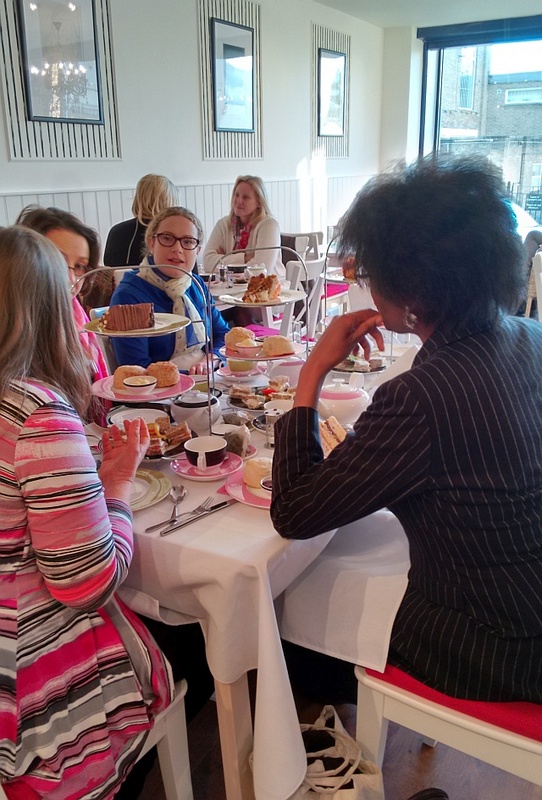 Beatons Blog : #Crowthorne: Afternoon High Tea for Reviewers! 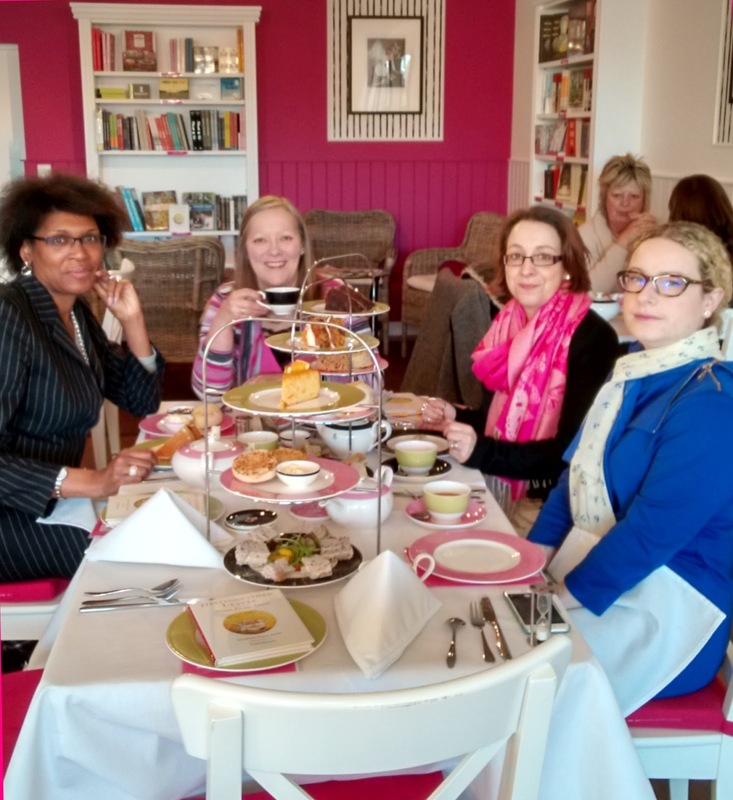 #Crowthorne: Afternoon High Tea for Reviewers! Oh goodness, we were barely open - in fact we were only unofficially open! But we'd already invited our guests, including Guest of Honour TV presenter and reporter Juliette Forster and we didn't want to start changing dates so we went for it... Hosting a reviewers' tea is one of my favourite 'chores' when a new tearooms opens, as you can imagine. ... and it was lovely, albeit the first time the new team at Beatons Crowthorne had even served an Afternoon High Tea. We also enjoyed the pleasure of the company of Rachael Kinsella an international tea blogger who writes under Tea with Rachael. Thanks for trekking out from London, Rachael. Sadly, three of our guests had last minute emergencies - although we managed to take a box of goodies round to Sandra at Body Image Crowthorne. Talk circled around the joy of switching off devices and whether we were losing the art of conversation as a society. We even touched on sensitive and deep subjects like death and discussed local economics, international property investment and... of course... tea and cake! It was a strong brew with some strong and successful business women. It was good to find support for Beatons' ethos of providing a 'restorative experience' and teaching attentiveness as part of how to deliver gracious hospitality. No one looked at their mobiles, except for the taking of these couple of photos, which fortunately Zoe reminded me was one of my duties. Kelly-Ann - our Crowthorne High Street neighbour from Whimsical Gifts - tried her first Jasmine Blossom green tea. Juliette relaxed, absorbed the surroundings and our Villeroy & Boch china, pronouncing Beatons to be 'a cake, a very iced cake'. Yes, we like being referred to as a cake! Thanks to all our guests and we hope to see you again at Beatons Crowthorne in the future. Afternoon High Tea at all our Beatons Tearooms comes served on a crisp white linen laid table, with your individual selection of cakes, scones, and finger sandwiches presented on a tiered cake stand. Discover more about our teas and menu here. We look forward to welcoming you for Afternoon High Tea at all of our tearooms and for the best possible experience recommend prior booking. Although we do not currently offer a gluten-free High Tea, we do always have Gluten Free options on the menu... and we are researching into how to make this a future delight. #Blandford: Beatons supports local authors! #beatonstearooms: winter weight loss suggestions! #Crowthorne: Work is cracking on in Crowthorne! #tea : for writer's block and staying awake! #Crowthorne: What we like about Crowthorne!